For thousands of years civilizations have extended social safety nets to its most disadvantaged members in order to ensure a minimal level of wellbeing. The Roman Empire, ancient Judaism, the Chinese Song Dynasty, the Catholic Church, Islam and many many other civilizations have a history of providing social welfare not only out of a humanitarian ethic, but in order to raise the quality of life of all citizens. “A nation’s greatness is measured by how it treats its weakest members,” to quote Mahatma Ghandi. This ethical imperative has come under assault in America from a vocal minority over the decades. From form President Ronald Reagan creating the now near-mythological “Welfare Queen” stereotype that pundits have regularly invoked in one form or another ever since, despite a dearth of evidence that such a person ever existed, to the more recent case of Fox News arguably going off the deep end in its efforts to demonize the poor in America (more examples here). They are decrying what they see as abuse of the social welfare system, and many of them advocate its dissolution altogether. What would happen if we got rid of social welfare altogether? Got rid of food stamps and other governmental forms of assistance to ensure poor children have proper nutrition, basic education, and health care? Science knows the answer. I did everything in my power a few months back to avoid all news about the British Royal Wedding that had so many Americans captivated. It was disheartening to see the American media paying so much attention to the antiquated and irrelevant institution of the Royal Family. It just seemed more than a little hypocritical as totalitarian rulers appointed by god are the antithesis of a country founded on the consent of the governed, a principle for which we had endured a bloody revolution to extricate ourselves from their rule. This revolutionary idea on which America was founded was inspired by the Age of Enlightenment, an intellectual movement that spawned so many of the ideas we take for granted today, but also one that we underappreciate or appear to have event forgotten in our academic institutions. Spending cuts outlined in the Continuing Resolution (CR) bill currently top out at $74 billion, but, with the Tea Party holding Republicans to principle, it will reach $100 billion (updated cuts here). Predictably, this bill has lots of bad news for Science and Technology in America; unfortunately, it maintains the status quo on oil and gas subsidies. The biggest cuts are to Energy Efficiency and Renewable Energy (-$786.3 million), the Environmental Protection Agency (-$1.6 billion), the Centers for Disease Control (-$755 million), Clean Water Funds (-$950 million), and a cut of $893.2 million to Science. It hurts, but it’s important to keep perspective. Some of these cuts are merely cancelling out the unspent portions of the American Recovery and Reinvestment Act of 2009, and we’ve been reminded from both sides of the aisle that “very hard choices” will need to be made on the deficit. 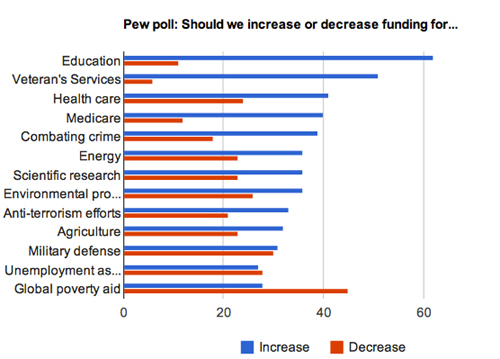 A look at the above Pew poll on where American’s think spending should be increased and decreased, and we have to admire the Republican Congress for taking such a political risk. But the respect is tempered by the fact that, while cutting subsidies for alternative energies, Congress won’t make the truly hard choice of cutting subsidies for the entrenched Oil and Gas industry, which receives $10 billion annually in subsidies, more than five and a half times the federal subsidies for renewable energy from 2002 to 2008. Internationally, fossil fuel subsidies are 12 times greater than support for renewable energies, $46 billion compared with $557 billion in 2008. 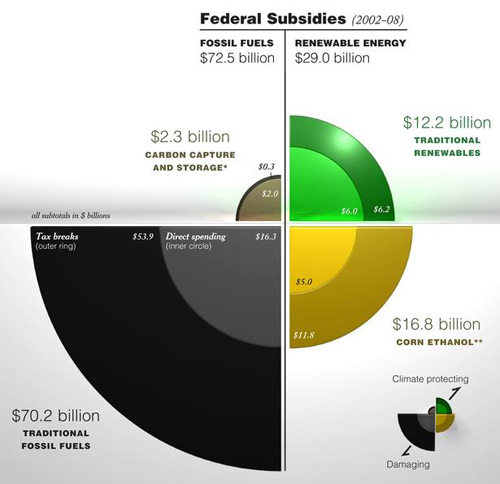 By maintaining tax subsidies that keep gas prices artificially low in the United States, the Federal government creates a distorted energy market where consumers cannot compare the true cost of fossil fuels to alternative energies. While I do feel the late Alaskan Senator Ted Stevens was treated a little unfairly by the webbernetting-meme-machine over his Internet as a “series of tubes” analogy, I also know that the anti-net neutrality advocate was extremely ignorant of how the Internet functions, as are almost the entirety of American politicians with their non-technical backgrounds. With the recent GOP takeover of Congress, I’ve seen numerous articles speculating on the death of Net Neutrality, but I fear it was dead no matter who controlled the government. Allowing Internet Service Providers (ISPs) to discriminate against network traffic with a tiered system would be a disaster of epic proportions for everyone who uses the Internet world wide. If you understand the architecture of the Internet, you understand that the preferential treatment of network traffic would quickly escalate beyond short-sighted offenses such as Cox Communications and Comcast blocking BitTorrent use into an arms race of ISPs undermining one another’s traffic. The elimination of Net Neutrality will quickly lead to a full-blown communications war. 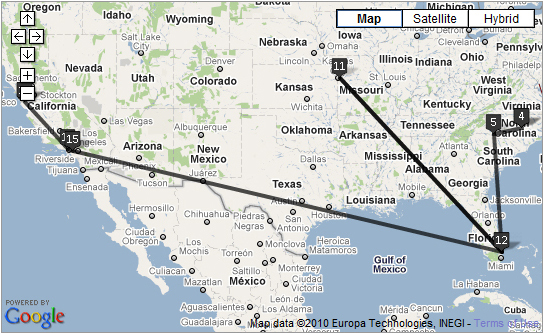 My connection to Google had to go through 19 locations and across approximately 5,821 miles. See number 11 on the map? That’s where the connection tried to go through one of Comcast’s routers, but couldn’t, and had to be redirected through another path along the network. That’s normal functioning for routers, which are dynamically calculating the best routes along the network for data packets all the time. Sometimes when I access Google the trace route will run all the way out to Europe and back to the United States to make a connection, a completely normal operation. Vicky and I sat in traffic, stood in lines, rode the metro, hopped off the metro for a desperation pee-break (for me), stood in more lines, rode more metro, shuffled forward for hours in massive crowds, and mostly missed all but bits and pieces of Jon Stewarts closing speech for the Rally to Restore Sanity, but the point wasn’t to be entertained, the point was to be represented. 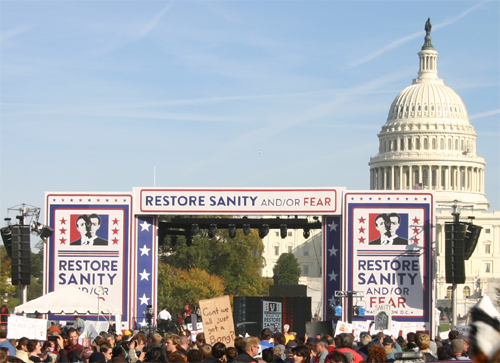 With best estimates of 215,000 attendees, we were adding ourselves to a show of support for reasonable discourse in American politics. This was a rally with strong roots in geek culture, from the initial petition calling for a rally to take place on 10/10/2010 (Powers of 10 Day) to raising half a million dollars for DonorsChoose in support of classroom projects, there was a heavy geek vibe to this movement. “HAVE U SPANKE IT TODAY?” Brilliant. What a profound statement. Well worth the investment of time and bravery. I like to think it makes the world a little more intellectually-engaging. African-American is a bogus, PC, made-up term. I mean, that’s not a race. Your ancestry is from Africa and now you live in America. Ok so you were brought over — either your family was brought over through the slave trade or you were born here and your family emigrated here or whatever but that is not a race. The term race is often used in taxonomy as a synonym for subspecies, in this sense human races are said not to exist, as taxonomically all humans are classified as the subspecies Homo sapiens sapiens. 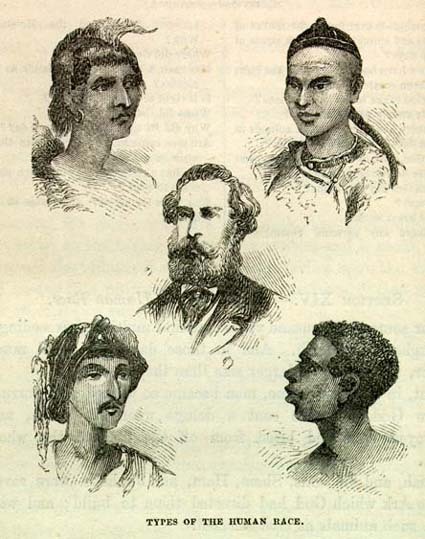 Many scientists have pointed out that traditional definitions of race are imprecise, arbitrary, have many exceptions, have many gradations, and that the numbers of races delineated vary according to the culture making the racial distinctions. Thus, those rejecting the notion of race typically do so on the grounds that such definitions and the categorizations which follow from them are contradicted by the results of genetic research. “Race” in the way the American government uses it and to what Beck is objecting is purely a social construct, subjective and devoid of scientific validity. The scientific definition of a “race” is “any inbreeding group, including taxonomic subgroups such as subspecies, taxonomically subordinate to a species and superordinate to a subrace and marked by a pre-determined profile of latent factors of hereditary traits. Every human being on this planet is capable of breeding with one another; therefore, we are of the same race. So what are Americans referring to when we checkmark “white”, “black”, “asian”, or “other” on our census and equal opportunity forms? I myself can claim to be white, Arab, Persian, or black depending on which of my hereditable traits you wish to focus on. Some critics argue that Barack Obama isn’t the first black president because he’s half white, but, because our American “race” isn’t based on genetics or ethnicity, we make it a matter of self-identification. There is nothing to prevent a white person from identifying themselves as black on a census form, and, in fact, the opposite has not been uncommon. While we are all Americans, our government must deal with the fact that some Americans have endured centuries of oppression as a result of their skin color and ethnic origins, people who are at a severe disadvantage today from such oppression, and our society has a responsibility to make amends. There is only one human race, but our civilization has been plagued by “racists,” people who believed their “race” was different from that of other human beings, and our census forms reflect this ignorant and destructive government-sanctioned heritage, just as our Constitution will always remind us of a time when slaves counted for 3/5ths of a person. Previously on ideonexus: The American Anthropological Association says There’s Only One Human Race. 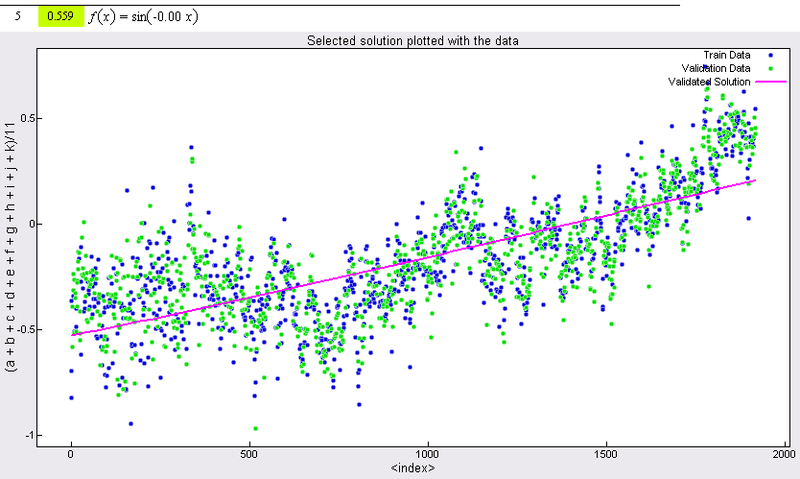 Friday I posted some links to the Cornell’s free data analysis software Eureqa. 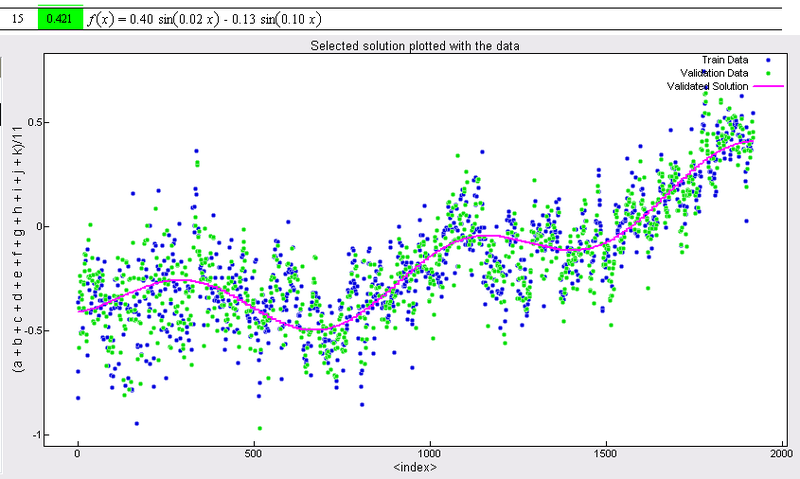 The video tutorials take a collection of data points from a swinging pendulum over time and then have the Eureqa software determine the function that best explains its wave using an evolutionary algorithm. 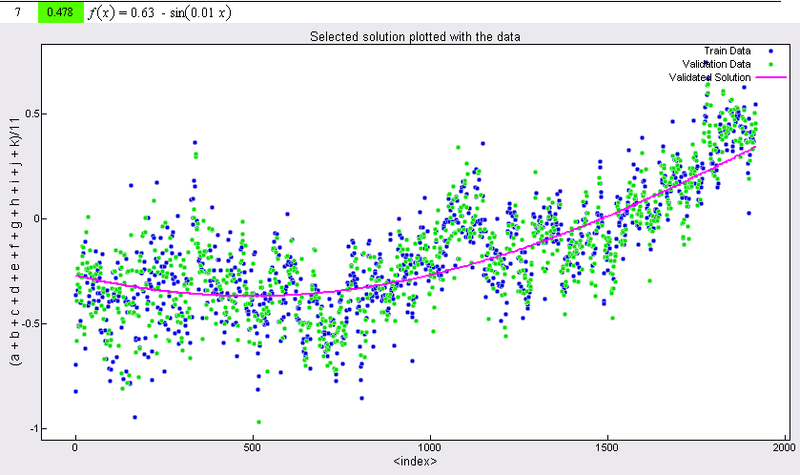 I played with the software a bit this weekend, trying out various datasets, when I remembered the wealth of global temperature data on the World Wide Web. With HadCRUT’s, NASA’s, UAH’s, and RSS’s data available online, I easily downloaded and imported the data into an excel spreadsheet, which made it easy to copy and paste into Eureqa. 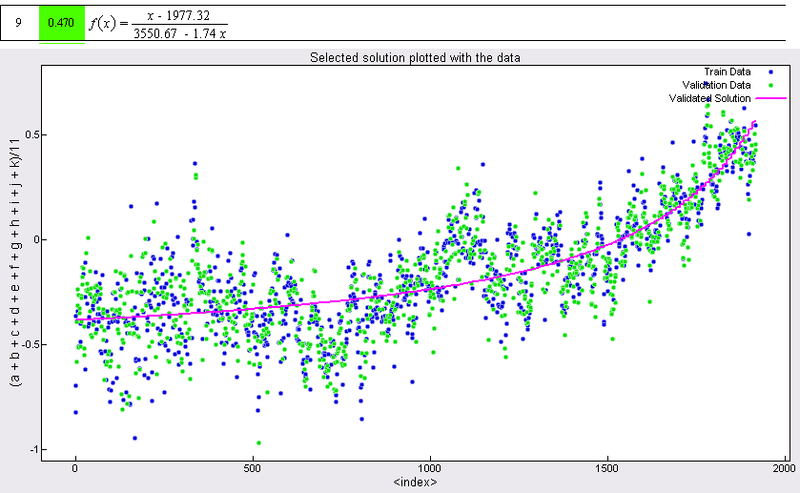 The HADCRUT data was the most thorough and extensive with over 21,000 points of data extending from 1850 to the present. It was also the most straightforward, which made it the most accessible for a non-statistician like myself. 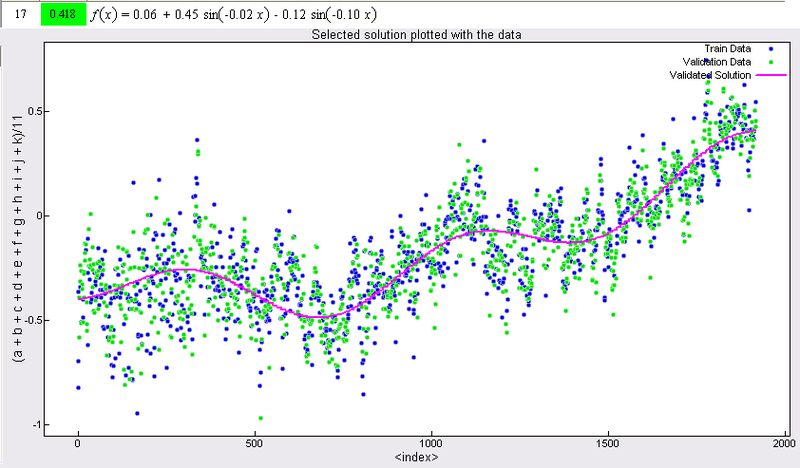 I had Eureqa search the average of the data points a through i against time for functions that best explain the relationship. 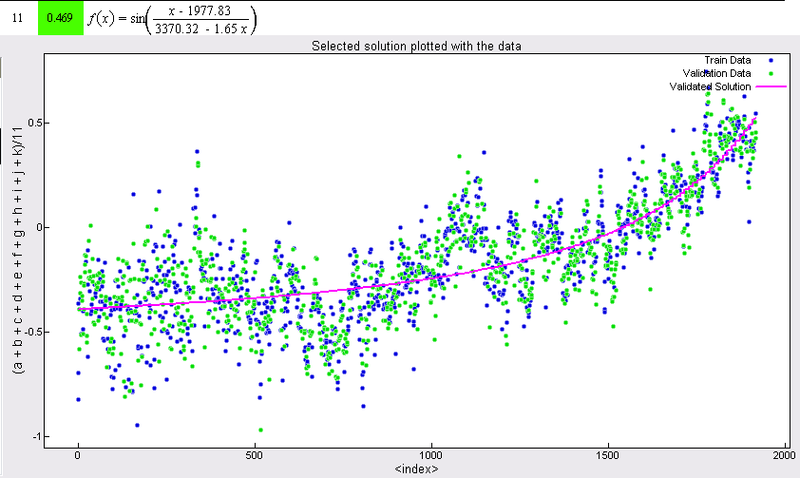 Each one of these functions depicts a clear warming trend over the last 160 years of measurements that looks a whole lot like Hansen’s instrumental record of global average temperatures, inferred through software lacking any bias or preconceptions. An acceptable criticism of this data is that it only goes back to 1850; however, any climate skeptic who believes this warming trend is only a cyclical phenomenon is welcome to plug the deluge of ice core data into Eureqa and post their findings. I strongly disagree with avid Plotz’s commentary, Dan Brown’s Washington, which argues that the real story of Washington is in the political players, not the spiritual and philosophical history which is the focus of The Lost Symbol. Dan Brown’s power as a writer is in having his characters take an intellectual adventure, travelling down pathways of obscure knowledge and history. The Lost Symbol is at its most intriguing when the characters are just standing around reasoning, however misrepresented their facts may be at times. If you can remember that Dan Brown writes fiction and ride along with his storytelling with a notepad and a critical eye, you can discover some very fascinating things to look for in Washington DC and the Enlightenment Era. 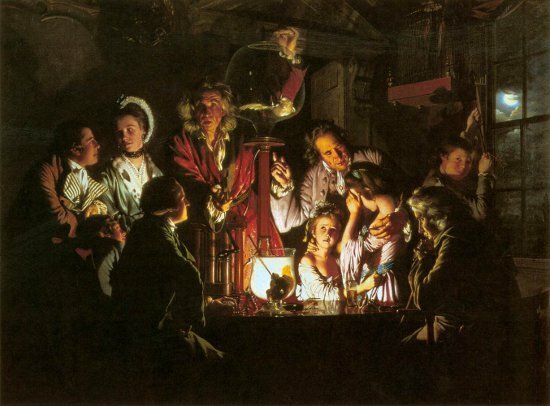 Thanks to Brown, I discovered the Invisible College, which was the precursor to the UK’s Royal Society, a society of scientists interested in understanding the world through empirical analysis. Today, the term serves to describe any method of attaining an education without going through an official academic route, similar to attending free courses online to get the knowledge, if not the course credit. 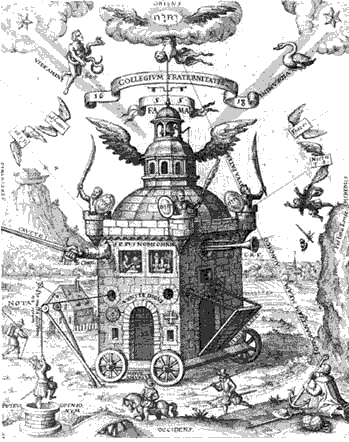 The Rosicrucians was another fascinating concept, linked to the Invisible College, another secret society that may or may not have existed, but two anonymous manifestos were attributed to the organization, Fama fraternitatis and Confessio Fraternitatis, that stirred up much intellectual debate in Europe, and may have contributed to the Enlightenment movement. One individual rumored to have written the manifestos was Francis Bacon, who’s New Atlantis, also mentioned in Brown’s book, which depicted a utopian society founded on the principles of free inquiry and scientific research. 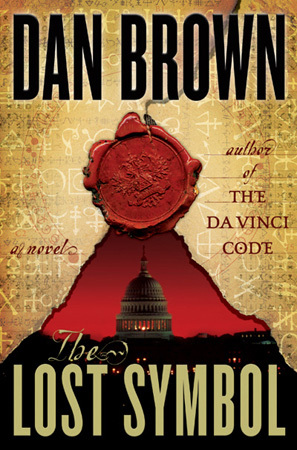 The Lost Symbol takes place across a wonderful variety of settings right around the Washington DC mall, which would be difficult to take in over the course of a week, much less during the single night in which Brown’s book takes place. 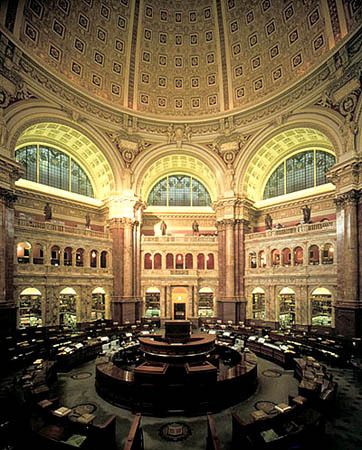 He hits most of the science imagery found in the Jefferson Reading Room, a fantastic monument to science, knowledge, and Enlightenment values. 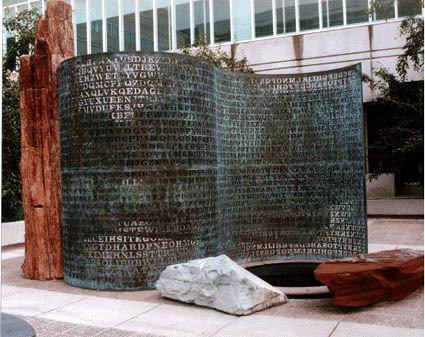 The US Botanical Gardens, National Statuary Hall, and the Kryptos Sculpture outside CIA headquarters are just a few fascinating locations in the book and they serve as just a glance at the immense amount of history packed into the nation’s capital. Brown has a penchant for silly academic scenes where Professor Robert Langdon wows awestruck students with seemingly incredible historical facts. The Lost Symbol delivers many of these, like when students mistake the pristine Smithsonian Castle for an ancient Norman castle so the Professor can correct them. But the Smithsonian is an incredible Institution, one that requires weeks to take in just what’s on display around the National Mall. Dan Brown introduces us to the Smithsonian Museum Support Center (SMSC), described in Smithsonian Magazine as the “Nation’s Attic,” which emphasizes that what the public can access in the museums is only a tiny fraction of the Smithsonian’s total collection. However, Brown’s book is a little out of date, as the squid and coelacanth referenced in the SMSC’s “Wet Pod” are currently on display at the Sant Ocean Hall in the Smithsonian museum of Natural History, which opened September 2008. 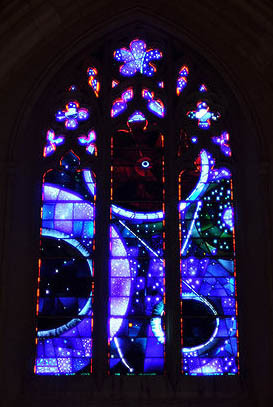 I never suspected there was anything at the Washington National Cathedral for me, an Enlightenment scholar, to appreciate; however, I am thankful to Dan Brown for introducing me to the Space Window, honoring the Moon landing, and includes a fragment of lunar rock brought back from an American lunar mission. The cathedral also features the head of Darth Vader as one of its gargoyles, voted by children as the scariest figure to fulfill the “role of the grotesque” in the architecture. 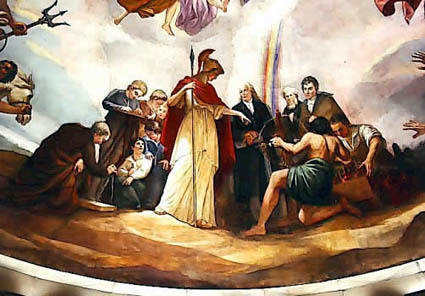 My favorite new Washington DC discovery in The Lost Symbol is the Apotheosis of Washington, the mural gracing the inside of the Capitol Building’s dome, which depicts the Founding Fathers and other great minds of their age receiving wisdom directly from the Roman gods. Ceres sits on a McCormick mechanical reaper, bringing agricultural science to Americans, Vulcan forges cannonballs in front of a steam engine, Venus helps to lay the transatlantic telegraph cable, and Minerva is shown bringing an electrical generator, batteries, and a printing press to the great American scientists Benjamin Franklin, Samuel Morse, and Robert Fulton. The problem is that all of these real-world settings and details prime us to believe other, wholly fabricated aspects of Brown’s storytelling. I unquestioningly swallowed the falsehood that the Founding Father’s originally planned to call our nation’s capital “New Rome,” because I knew they were heavily influenced by the Greek Democracy and Roman Republic; however, I have found no evidence that the FF intended this whatsoever, and must assume that it has no basis in fact1. 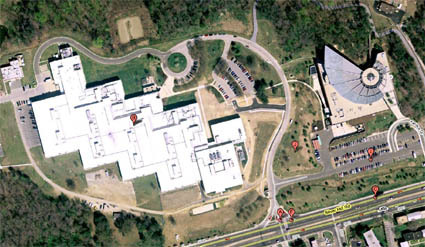 Brown’s protagonist, Robert Langdon, asserts at one point that Google is not research. Maybe Brown fears his readers discovering snopes.com or other original sources where they can find out how he has exaggerated or misrepresented material. For instance, the way he overhypes the CIA’s Stargate Program, which experimented with remote viewing, but was cancelled without producing anything conclusive. Or the importance of the Noetic Sciences, which deals with supernatural ways of coming into knowledge, and, despite millions of books being sold on the subject, has yet to produce anything empirical. He mentions that meditating Yogis, produce a miraculous waxy substance from their pineal glands, but fails to mention this substance would be melatonin (there’s no evidence for Brown’s statement anyway). And, of course, 2012 has to make an appearance as well. Brown ties together the facts that Isaac Newton’s temperature scale had 33 degrees (zero being freezing, 33 boiling), there are 33 Vertebrae in the human spine, and 33 degrees in the Scottish Rite of Freemasonry as proof that 33 is perceived as a powerful number in mysticism. If Dan Brown had wanted to weave the number into his storytelling a little more, he could have included Dante’s Divine Comedy (3 canticas with 33 cantos each), the number of segments in the United Nations’ symbol, and the coming of age for hobbits in the Lord of the Rings according to Wikipedia. These words are technically true, but are highly misleading for the context in which they appear in The Lost Symbol. Dan Brown is trying to make it seem as if the Founding Fathers thought there was a hidden mystical meaning in the Bible, but this was not Thomas Jefferson’s intent in crafting his own version of the Bible. Jefferson started out constructing a simplified version of the New Testament that American Indians could easily understand, but turned to extracting what he considered Jesus’ true philosophical intent from what he came to see as the morass of supernatural embellishment the evangelicals had brought into the scriptures. Thomas Paine was highly critical of the Bible, not seeing a hidden mystical meaning, but a philosophy that he found morally reprehensible. Peter once compared Noetic Scientists to the early explorers who were mocked for embracing the heretical notion of a spherical earth. Almost overnight, these explorers went from fools to heroes, discovering uncharted worlds and expanding the horizons of everyone on the planet. This is nonsense and bad history. In American public schools we are taught that Columbus’ journey to find a western route to India was all the more amazing because everyone at the time thought the Earth was flat. While this makes his story more compelling, the reality was that the Earth’s spherical nature was a well-established fact. Aristotle knew the Earth was round in the third-century BC by observing its shadow on the Moon, Alexandria philosopher Eratosthenes had estimated the size of the Earth, and the early Romans were the first to suggest the idea of a westward route to India. Columbus’ opponents knew the Earth was round; however, they believed the explorer had grossly underestimated its size. Dan Brown is himself guilty of underestimating the “wisdom of the ancients2” in not knowing that the ancients knew the Earth was round. The problem is, if you believe the conspiracy theory that all this powerful forbidden knowledge is being obfuscated by secret societies, then the fact that original documents reveal a truth that is devoid of supernaturalism, however intriguing their philosophical debates, then the lack of evidence is merely more support for the conspiracy to hide the “truth.” It’s a catch-22: there’s no evidence of a conspiracy to hide what the conspiracy theorist wants to believe; therefore, the conspiracy theorist takes this as evidence that the knowledge is being effectively hidden3. …the cosmic religious feeling is the strongest and noblest motive for scientific research. Only those who realize the immense efforts, and, above all, the devotion without which pioneer work in theoretical science cannot be achieved are able to grasp the strength of the emotion out of which alone such work, remote as it is from the immediate realities of life, can issue. What a deep conviction of the rationality of the universe and what a yearning to understand, were it but a feeble reflection of the mind revealed in this world, Kepler and Newton must have had to enable them to spend years of solitary labor in disentangling the principles of celestial mechanics! 1 The only reference I could find to America and “New Rome” was as a pejorative in a commentary by Osama Bin Laden. 2 Part of the “wisdom of the ancients” Brown cites is the ingenuity of Alchemy, from which he conveniently leaves out the fact that his icon, Isaac “Jeova Sanctus Unus” Newton poisoned himself by playing with and tasting Mercury. 3 Full disclosure, I am a Discordian, so technically I am part of the conspiracy, but since organization is against the principles of Discordianism, it must purely be an emergent phenomenon. 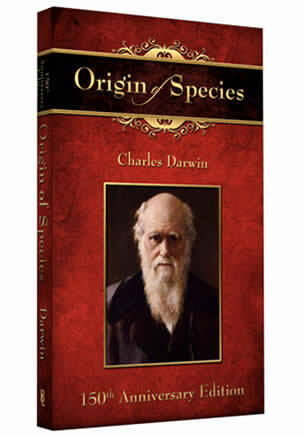 As was covered in Science Etcetera, the Living Waters Ministries has started a campaign to distribute copies of Darwin’s Origin of the Species on College Campuses, to which Ray Comfort, a critic of evolutionary theory, has added a 50 page introduction attempting to refute evolution. The link to a free PDF of the introduction appears to have gone dead. Luckily, you can still read it here through the magic of Google cache. I also downloaded a copy of the intro, which I’ve uploaded so you can download it here. Unfortunately, Ray Comfort’s introduction itself is a very flawed, irrational, and misinformed work. Comfort’s rebuttal of evolution includes all the classics. There’s the watchmaker argument that the more complex an entity, the more evidence that it was engineered by a creator, which makes the Creator even more complex, begging the question of what created the Creator? There’s the chicken and egg argument, that certain organs and structures require one another to exist, and therefore could not have evolved gradually, which is an argument that relies heavily on a willful ignorance of biology and how these systems work in less complex species. There’s the god of the gaps argument, that missing links disprove evolution–an argument that works well in Creationists’ favor as every time a missing link is discovered, two more are created, but has the unfortunate side effect of squeezing god into smaller and smaller spaces as our understanding of reality expands. Besides, it’s not even scientifically possible to prove that something has no use, because its use can always be discovered as more information becomes available. Isn’t it possible that the same could be true with God? Just because you’re ignorant of His presence doesn’t mean He doesn’t exist. And don’t look to Neanderthal Man for any evidence of evolution. He died of exposure–his skull was exposed as being fully human, not ape. Not only was his stooped posture found to be caused by disease, but he also spoke and was artistic and religious. Am I reading this correctly? Comfort is implying that we believe Neanderthals once roamed the Earth–from the sound of it–on the basis of a single skeleton? A skeleton, he argues, that was only different because it was diseased? What about the other 400 Neanderthal skeletons archaeologists have uncovered since the 1850s? And what does being artistic and religious have to do with anything? 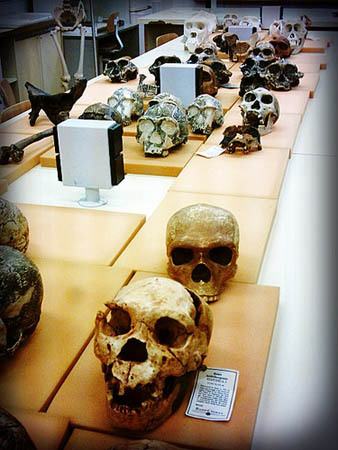 Evolution doesn’t preclude the idea that other branches of Homo could have had culture. In fact, today we know that even chimpanzees have culture. So perhaps Comfort is simply ignorant of the current science. Maybe he had to do his research with journal articles from the 1850s. Who knows? He doesn’t provide any citations for the reader to follow up on his sources and check their accuracy. However, there is evidence of Comfort selectively pulling from his references, taking them out of context to support his ideas. For instance, there are three full pages of Hitler quotes, and it would be intellectually dishonest to deny the way history’s greatest monster applied aspects of evolutionary theory to his own personal philosophy of racial purity; however, this is a rhetorical sword that cuts both ways. For every example of Hitler invoking something akin to Darwinism in his Nazi movement, there is an example of him invoking Christianity to motivate the German people to the same ends. As Hitler writes in Mein Kampf, “Hence today I believe that I am acting in accordance with the will of the Almighty Creator: by defending myself against the Jew, I am fighting for the work of the Lord.” It would be logically fallacious of me to present such a quote as evidence of Hitler being inspired by Christianity, because, in the larger context of everything we know about Hitler’s political philosophy, fascism is an animal completely alien to all forms of philosophical and political thought. This is why it is fair to invoke Goodwin’s Law against Ray Comfort for cherry-picking from history those passages that support his attempt to connect Darwin and Nazism, while ignoring fascism’s connections to numerous religions and political ideologies. Comfort invokes the something from nothing argument as his strongest point against the theory of evolution, but Darwin, evolution, and natural selection have absolutely nothing to do with this question whatsoever. The origin of our Universe concerns the Big Bang theory, of which scientists are still actively trying to figure out the details. Details found in equations that require substituting infinity for many variables as you count down to the moment before the Big Bang. While “God” is supposed to be infinite, it does not effectively resolve this question because, as with the watchmaker argument, we are still left to wonder how god came from nothing. Why we exist instead or not existing is a beautiful mystery we can all enjoy, people of faith and people of none. 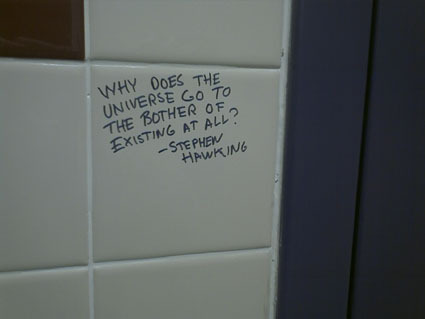 It is a question on which many great scientific minds have speculated. Stephen Hawking asked, “Why is there something instead of nothing?” Carl Sagan famously said, “In order to make an apple pie from scratch, you must first invent the universe.” It is science however, not religion, that shows humility before this mind-straining idea in admitting and accepting our ignorance of the answer. 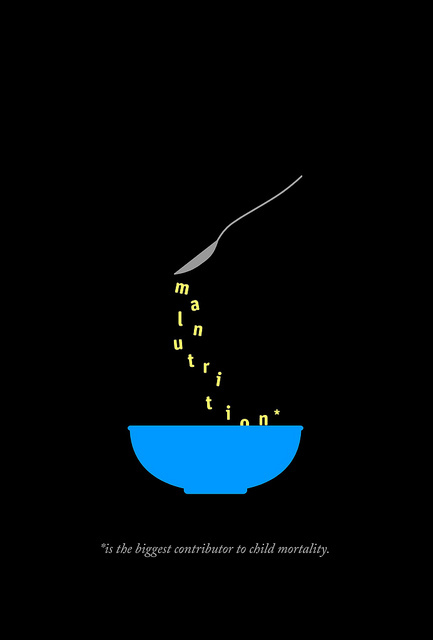 1 The text is an abridged version of Origin, but I won’t fault the Ministry for that. So long as the text has not been manipulated or selectively abridged in such a way as to subvert Darwin’s hypothesis. In this post, I am giving the Ministry the benefit of the doubt. The full text of Origin of the Species is in the public domain, and may be downloaded at Project Gutenberg.